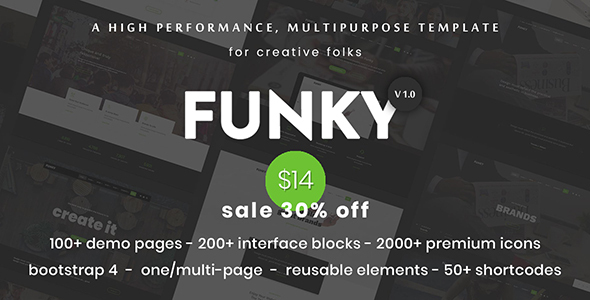 Funky is a complete and versatile HTML template that is perfect for creative portfolios ЁC from bloggers, freelancers and photographers to restaurants, commercial stores and travel agencies. Whether you want to present a collection of work, inspiration, products or services, this multipurpose template has every detail covered. Choose from a wide range of one page or multi-page concepts, with an ever-growing collection of pre-built demos to get you started. Funky invites you to display your portfolio in a classic grid or in an easy-on-the-eye, Pinterest-style masonry layout that maximizes the space on the page. Thanks to Ajax, your users will enjoy quicker and smoother interactivity, without the need to reload pages, and easier navigation. The Mega Menu allows you to create a drop-down menu in a single, large panel, so that every category within your site is available at a glance, with no need to scroll. Mega Menu also gives you greater flexibility and creative freedom as you can insert graphics and icons for a more engaging user experience. With Funky, every detail of your site is taken care of. The template includes over 2000 premium icons and 10+ beautiful page load styles, so you can engage with your users even while they wait for your content to load. Not only that, but Funky comes with pre-built pricing tables, to save you time as you get your site up and running. With this advanced, multipurpose template, your creative or commercial portfolio is not only responsive but also scalable on all devices, with smooth scrolling, so your users can enjoy a superior user experience, whether at home or on the go. - Unlimited Colors. Create your custom color scheme with only a few clicks! - Excellent Customer Support ЁC We care about your site as much as you do and will help in any way we can! - The images used on the demo site are for demonstration purposes only and are not included in the download file. We have included placeholder images for each instance. Leto - Creative Minimal Portfolio Template; Namos - Creative One/Multi-Page Portfolio Template; Kratos - Creative Portfolio Agency Template; The Litae - Creative & Minimal Portfolio WordPress Theme; Eurybia - Creative Portfolio WP Theme; Hedone - Creative & Clean Portfolio / Agency Template; The Litae - Creative & Minimal Portfolio / Agency Template. Keywords: agency, ajax, blog, corporate, creative, magazine, modern, multi, onepage, parallax, portfolio, purpose, video, vimeo, youtube. Premium ThemeForest Funky Professional Creative Multi-Purpose Template 20771586 WordPress Themes, Website Templates, Mobile Themes, Flash Templates & Scripts from creative professional designers. Full details of ThemeForest Funky Professional Creative Multi-Purpose Template 20771586 for digital design and education. ThemeForest Funky Professional Creative Multi-Purpose Template 20771586 desigen style information or anything related.